Product prices and availability are accurate as of 2019-04-18 11:23:47 UTC and are subject to change. Any price and availability information displayed on http://www.amazon.com/ at the time of purchase will apply to the purchase of this product. 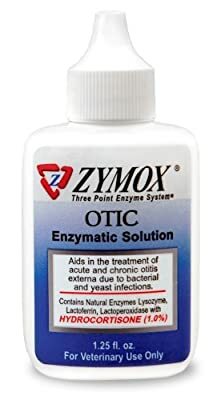 The Zymox Otic Pet Ear Treatment with Hydrocortisone is a really useful tool in promoting your dog's ear health as it treats for inflammation of the external ear caused by bacterial, viral, and yeast infections and eliminates organisms that are resistant to antibiotics. This can be used in acute cases where there is a lot of inflammation present.